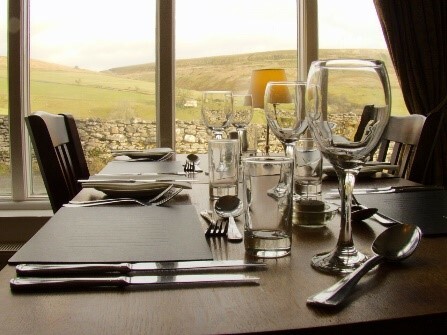 Our restaurant boasts stunning views across Swaledale and is open to both residents and non-residents. Our chef Adam, wherever possible sources produce locally, with our butcher and fruit & vegetable suppliers based only a few miles away in Wensleydale. If you have any special dietary requirements Adam is always happy to discuss these with you. At weekends we offer a lunchtime menu with a selection of sandwiches and homemade soup. In the evening we offer an excellent range of starters, main courses and desserts and also offer a number of seasonal specials that take advantage of the best of the Dales' local produce.